Common Cause NY is partnering with the New York City Council, NYC Votes and the Department of Education on a pilot program for Student Voter Registration Day, Friday March 20, 2015 to increase youth voter registration and excite young people about being involved in the democratic process. SVRD is being held close to Democracy Day, celebrating when 18-year-olds won the right to vote. 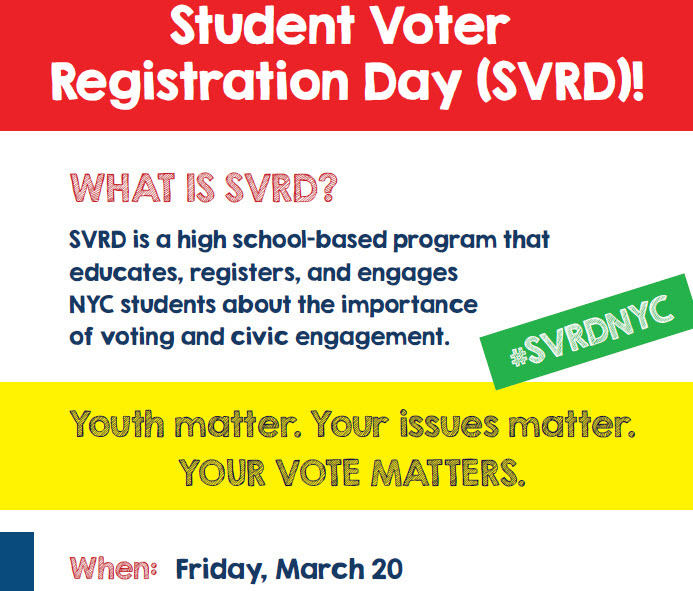 Student Voter Registration Day (SVRD) 2015 is a single-day program that educates NYC students about the importance of voting and civic engagement. Through interactive discussion SVRD encourages youth to see how issues at the polls affect their everyday lives. Over 30 schools from across the city will be participating in this first year initiative!